The JF506E is a front wheel drive 5 speed automatic transmission produced by the Japanese Automatic Transmission Company or more commonly known in the industry simply as JATCO. JATCO manufactures automatic units for automobile companies such as Volkswagen, Landrover, Mazda, Rover, SEAT and Ford just to name a few. The JF506E is also known by different names depending on the vehicle manufacture. For example VW refers to it as the 09A and Mazda as the RE5F01A; it is also known as 5F31J and JA5A-EL. The "E" at the end of the name stands for electronically controlled, which this unit is. 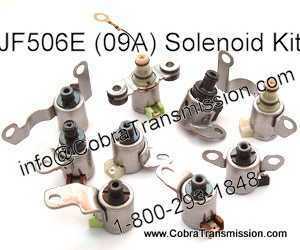 It contains 9 solenoids to control about every aspect of the unit. Below is a list of each of the solenoid with a link to purchase each one or you can purchase the kit too. A common issue I hear a lot is when the transmission is cold it does not shift correctly. Once it warms up for 10, 15 or 20 minutes the transmission starts to shift normally. This could be a solenoid or a valve body issue in most cases. Sometimes when you change a solenoid as a result of a code and you put everything back together you get another code for a different solenoid that was not present the first time you scanned the vehicle. This in particular could be costly, not to mention a bit aggravating. This is why it is recommended to go with the kit, especially if you plan to replace two or more. If you have any questions or comments please feel contact us via the Contact Us Page.